As Shanghai continues to grow, existing bridges are being widened and new bridges are being built across Suzhou Creek. The 100 year old Henan Road Bridge has been reconstructed to make room for a subway tunnel and to add two traffic lanes. The work began in 2006 and was completed in August 2009. The rebuilt bridge will be 29 m wide, which is 10.5 m wider than the old bridge. Because the creek is only about 50 m wide, many feel that the new Henan Road Bridge ruins the environment along the creek. I know that when I walk under a very wide bridge, I feel like I'm walking through a tunnel. The new bridge is 355 m long and connects Beijing East Road along the south side of the creek to Tiantong Road along the north side of the creek. The original bridge had arches over the river, spires over the piers, and a floral pattern along the barriers. The new bridge maintains these architectural features. 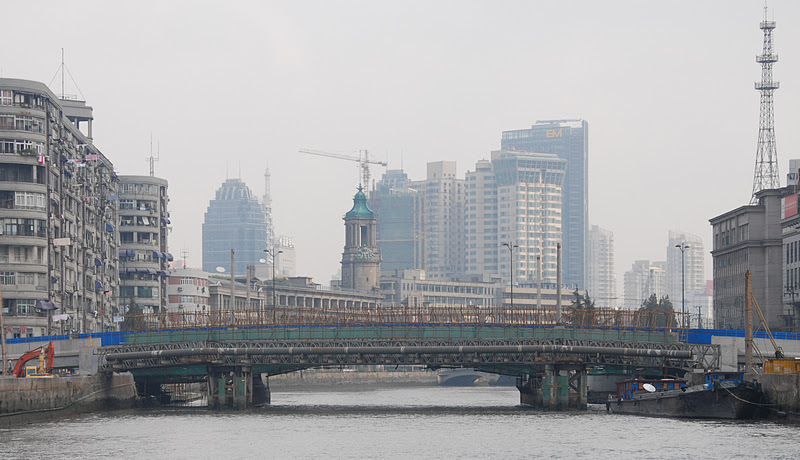 Shanghai is building or rebuilding many wide bridges over the Suzhou Creek. The new Qilianshan Road Bridge has a width of 38 meters and is the widest bridge over Suzhou Creek. Older bridges like the Waibaidu and Zhejiang Road Bridges are under 20 m wide. Shanghai's Bridges: Henan Road Bridge by Mark Yashinsky is licensed under a Creative Commons Attribution-NonCommercial-ShareAlike 3.0 United States License.